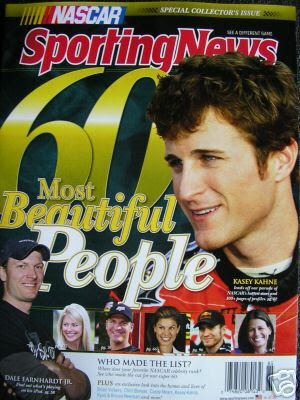 Sports fans or anyone wanting to learn more about NASCAR, here's a publication you should pick up: NASCAR's 60 Most Beautiful People. Published by Sporting News, which is based in Charlotte and is well-known for these types of "yearbooks," this is the inaugural edition and it offers an interesting look into the sport. The issue profiles the drivers, pit-crew guys, mechanics, media personalities, and wives who live the fast-track life. If you read this blog often, you know what part I'm most interested in: the chicks. Man Law. You ladies might be interested in Kasey Kahne, who tops the list, or Dale Earnhardt Jr., but NASCAR drivers have some of the hottest wives of all professional athletes. It's almost unfair. Those lovely ladies making the list, many who live in Charlotte and particularly the Lake Norman area, include Chandra Johnson (Jimmie Johnson), Krissie Newman (Ryan Newman), and Ingrid VandeBosch (Jeff Gordon). But the list isn't all about vanity. Several people made the list because they're "beautiful on the inside," highlighted because of their work in the community. You can pick up a copy on most major newsstands or by visiting www.sportingnews.com and clicking on "Yearbook" at the top of the page.